The Alaska cruising season runs from May through the middle of September. 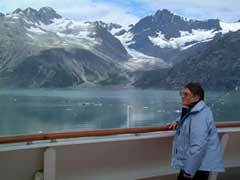 You will find many of the best cheap Alaska cruises in the months of May through September. These are considered the “shoulders” of the season. These months will also offer beautiful views of the wildflowers blooming as well as the change of colors of the foliage. You will also find some of the best Alaska cruises from Vancouver during the months of May and September. If you are traveling with children, the best time to cruise to Alaska is in July and August as these are the warmest months in Alaska. The temperature in these months will not usually go over 70 degrees Fahrenheit making this perfect weather for viewing the natural beauty of Alaska. During these months, children will marvel at the beauty as they watch the whales frolicking in the ocean. Summer also brings many bugs to Alaska, for this reason if you don’t want to deal with those pesky critters, September is the best time to avoid “bug season”. Because of the bugs during the late spring and summer months it is a good idea to add bug spray as well as sunblock to your Alaska cruise packing list. In addition to deciding the best time to cruise to Alaska, it is equally important to keep some basic Alaska cruise tips in mind. Some of these include bring sensible shoes and warm clothing. While it is warm during the summer months by Alaska standards, visitors coming from the more southern region of the world will definitely feel the chill. The best time to cruise to Alaska really depends on the individual planning the cruise. Whichever of these times of year that you choose, you will marvel at the natural beauty of Alaska and the wildlife. One of the best things about your cruise is that you will never run out of daylight as during these months there is anywhere between 16-20 hours of daylight.